What are the effects of termites in my home? Think of the value of your property. On the outside and basic interior your home looks great. 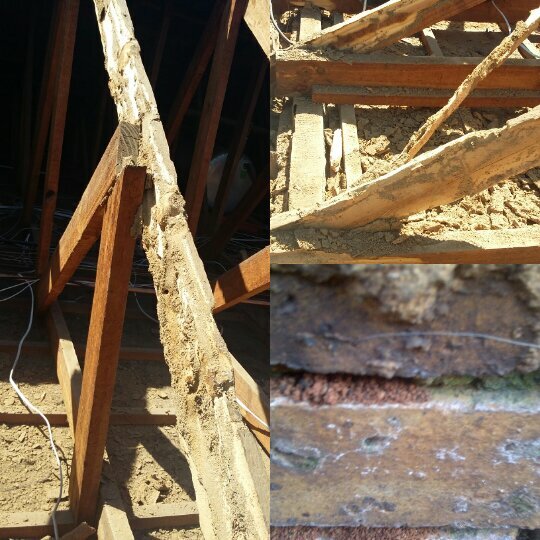 Beneath the surface such as your ceiling, wooden frames and garden, there are termites depreciating that value daily. Think of the wooden beams in the ceiling cavity of your home. This is the most common place where you can find termites infesting. This of the rain that falls on your roof, there is so much moisture produced by the rain that falls on the tiles of your roof. Think of the leakage that can occur or that is already there creating this moisture. This is what attracts termites to your home.Eco-Smart Pest Control cleans and vacuums your ceiling. This allows for them to clean and treat your ceiling cavity to prevent termites from entering and infesting your home. How do termites infest my home? Think of those lovely laminated floors in your home, the wooden doors and door frames and the stylish skirting boards. When you wipe down or clean your floors you need to use a water based substance. Some floors do not allow for detergents to be used and diluted in the water. You can only dry the floor to a certain extent and this is where the moisture builds up in the wooden structures of your house. A professional Pest Control agency will need to come in and examine which species of termites have infested your home to properly exterminate them. How do termites affect my garden? Termites can be harmful to your garden and cause damage to your little vegetable garden. They can also cause harm to your plant and lawn areas. Eco-Smart Pest Control uses green Eco-friendly pest control chemicals which do not harm your vegetation. This substance only treats and exterminates termites and insects in your garden. ← Pest Control: How to get rid of rats in my ceiling and home?